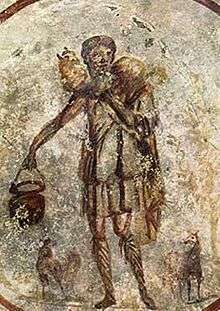 The Shepherd of Hermas, or the Good Shepherd, 3rd century, Catacombs of Rome. The book was originally written in Rome, in the Greek language, but a first Latin translation, the Vulgata, was made very shortly afterwards. A second Latin translation, the Palatina, was made at the beginning of the fifth century. Only the Latin version has been preserved in full. Of the Greek version the last fifth or so is missing. The shepherd is one of the meanings that was probably attached to some figurines of the Good Shepherd as well as a symbol for Christ, or a traditional pagan kriophoros. The book consists of five visions granted to Hermas, a former slave. This is followed by twelve mandates or commandments, and ten similitudes, or parables. It commences abruptly in the first person: "He who brought me up sold me to a certain Rhoda, who was at Rome. After many years I met her again, and began to love her as a sister." As Hermas was on the road to Cumae, he had a vision of Rhoda. She told him that she was his accuser in heaven, on account of an unchaste thought the (married) narrator had once had concerning her, though only in passing. He was to pray for forgiveness for himself and all his house. He is consoled by a vision of the Church in the form of an aged woman, weak and helpless from the sins of the faithful, who tells him to do penance and to correct the sins of his children. Subsequently he sees her made younger through penance, yet wrinkled and with white hair; then again, as quite young but still with white hair; and lastly, she shows herself as glorious as a Bride. This allegorical language continues through the other parts of the work. In the second vision she gives Hermas a book, which she afterwards takes back in order to add to it. The fifth vision, which is represented as taking place 20 days after the fourth, introduces "the Angel of repentance" in the guise of a shepherd, from whom the whole work takes its name. He delivers to Hermas a series of precepts (mandata, entolai), which form an interesting development of early Christian ethics. One point which deserves special mention is the assertion of a husband's obligation to take back an adulterous wife on her repentance. The eleventh mandate, on humility, is concerned with false prophets who desire to occupy the first seats (that is to say, among the presbyters). Some have seen here a reference to Marcion, who came to Rome c. 140 and desired to be admitted among the priests (or possibly even to become bishop of Rome). After the mandates come ten similitudes (parabolai) in the form of visions, which are explained by the angel. The longest of these (Similitude 9) is an elaboration of the parable of the building of a tower, which had formed the matter of the third vision. The tower is the Church, and the stones of which it is built are the faithful. But in the third vision it looked as though only the holy are a part of the Church; in Similitude 9 it is clearly pointed out that all the baptized are included, though they may be cast out for grave sins, and can be readmitted only after penance. In spite of the grave subjects, the book is written in a very optimistic and hopeful tone, like most early Christian works. In parable 5, the author mentions a Son of God, as a virtuous man filled with a Holy "pre-existent spirit" and adopted as the Son. In the 2nd century, adoptionism (the view that Jesus Christ was at least initially, only a mortal man) was one of two competing doctrines about Jesus' true nature, the other being that he pre-existed as a divine spirit (Logos); Christ's identity with the Logos (Jn 1:1) was affirmed in 325 at the First Council of Nicaea. Bogdan G. Bucur, however, notes how widely accepted the Shepherd of Hermas was among "orthodox" Christians, yet was never criticized for apparently exhibiting an adoptionistic Christology. He suggests that the passage in question should be understood as Jesus making his dwelling within those who submit to his spirit, so that the "adoption" that takes place is not of Jesus but of his followers. Textual criticism, the nature of the theology, and the author's apparent familiarity with the Book of Revelation and other Johannine texts, are thought to set the date of composition in the 2nd century. However, several ancient witnesses support an early dating and there is internal evidence for the place and date of this work in the language and theology of the work. The reference to an unknown Clement is presumed by some to be Clement of Rome; if this is that Clement, it would suggest a date c. 90 for at least the historicised setting of the first two visions. Since Paul sent greetings to a Hermas, a Christian of Rome (Romans 16:14), a minority have followed Origen of Alexandria's opinion that he was the author of this religious allegory. But Hermas wrote The Shepherd very recently, in our times, in the city of Rome, while bishop Pius, his brother, was occupying the chair of the church of the city of Rome. And therefore it ought indeed to be read; but it cannot be read publicly to the people in church either among the Prophets, whose number is complete, or among the Apostles, for it is after their time. The Liberian Catalogue of Popes, a record that was later used in the writing of the Liber Pontificalis, states in a portion under the heading of 235: "Under his [Pius'] episcopate, his brother Ermes wrote a book in which are contained the precepts which the angel delivered to him, coming to him in the guise of a Shepherd." A poem written against Marcion from the 3rd or 4th century, by a writer adopting the name and persona of Tertullian — and sometimes therefore referred to as "Pseudo-Tertullian" — states "Then, after him, Pius, whose brother according to the flesh was Hermas, the angelic shepherd, because he spoke the words given to him." Note that Pseudo-Tertullian quotes some details from this list which are absent from the Liberian Catalogue, which may mean that he is independent of it. a) Robinson believes that all the canonical New Testament books predate the fall of Jerusalem in AD.70. b) Irenaeus quotes it as scripture in "Against Heresy" (c. 180) thus undermining the testimony of the Muratorian fragment, which, if believed, would place it during the bishopric in Rome of Pius (140–155). Robinson believes that Irenaeus would not count a 2nd-century text as scripture. c) Tertullian, in De Pudicitia (c. 215) strongly disparages Hermas, but without mentioning the late composition which would have fatally undermined its canonicity. d) Origen freely cites Hermas as scripture, and in his Commentary on Romans attributes it to the Hermas of Rom.16:14 (an identification supported by Coleborne ). e) Robinson believes that the internal evidence of Vision 2.4.2 refers to Clement, apparently before he became Bishop of Rome, for which Robinson cites in support G. Edmundson's Bampton lectures of 1913. Edmundson dates Hermas c. 90 on the basis that Clement became Bishop of Rome in 92. Robinson states that there is no reason to suppose that this reference is a pseudonymous fiction. f) Robinson discounts the testimony of the Muratonian fragment, saying that for no other book should its unsupported evidence be taken seriously, and it is full of palpable mistakes. The Shepherd makes many allusions to the Old Testament. According to Henry Barclay Swete, Hermas never cites the Septuagint, but he uses a translation of Daniel akin to the one made by Theodotion. He shows acquaintance with one or another of the Synoptic Gospels, and, since he also uses the Gospel of John, he probably knew all four. He appears to employ Ephesians and other Epistles, including perhaps 1 Peter and Hebrews. But the books he most certainly and most often uses are the Epistle of James and the Book of Revelation. Remarks of Tertullian and Clement of Alexandria give a sense of resistance to the Shepherd among its hearers, and of a sense of controversy about it. Tertullian implies that Pope Callixtus I had quoted it as an authority (though evidently not as one of the books of the Bible), for he replies: "I would admit your argument, if the writing of the Shepherd had deserved to be included in the Divine Instrument, and if it were not judged by every council of the Churches, even of your own Churches, among the apocryphal and false." And again, he says that the Epistle of Barnabas is "more received among the Churches than that apocryphal Shepherd" (De pudicitia, 10 and 20). Though Clement of Alexandria constantly quotes with reverence a work that seems to him to be very useful, and inspired; yet he repeatedly apologizes, when he has occasion to quote it, on the ground that "many people despise it". Two controversies divided the mid-century Roman Christian communities. One was Montanism, the ecstatic inspired outpourings of continuing pentecostal revelations, such as the visions recorded in the Shepherd may have appeared to encourage. The other was Docetism that taught that the Christ had existed since the beginning and the corporeal reality of Jesus the man was simply an apparition. Cyprian makes no reference to this work, so it would seem to have gone out of use in Africa during the early decades of the 3rd century. Somewhat later it is quoted by the author of the pseudo-Cyprianic tract Adversus aleatores as "Scriptura divina", but in Jerome's day it was "almost unknown to the Latins". Curiously, it went out of fashion in the East, so that the Greek manuscripts of it are but two in number; whereas in the West it became better known and was frequently copied in the Middle Ages. ↑ "The Pastor of Hermas was one of the most popular books, if not the most popular book, in the Christian Church during the 2nd, 3rd and 4th centuries. It occupied a position analogous in some respects to Bunyan's Pilgrim's Progress in modern times." (F. Crombie, translator of Schaff, op. cit.). ↑ Aland, Kurt; Barbara Aland (1995). The Text of the New Testament: An Introduction to the Critical Editions and to the Theory and Practice of Modern Textual Criticism, trans. Erroll F. Rhodes. Grand Rapids, Michigan: William B. Eerdmans Publishing Company. p. 107. ISBN 978-0-8028-4098-1. ↑ Philip Schaff wrote hopefully, "It would not be a very bold conjecture, that Hermas and his brother were elderly grandchildren of the original Hermas, the friend of St. Paul. The Shepherd, then, might be based upon personal recollections, and upon the traditions of a family which the spirit of prophecy had reproved, and who were monuments of its power." (Schaff, Fathers of the Second Century: Hermas, Tatian, Athenagoras, Theophilus, and Clement of Alexandria, introduction to "the Pastor of Hermas"). ↑ A suggestion made by Bunsen, Hippolyrus and His Age, vol. I p 315. ↑ This is a specific refutation of the continuing revelations (charismata) expressed by the Montanists. Hermas' Shepherd on earlychurch.org.uk Bibliography and links to on-line articles.